August | 2015 | W.O.D.D. Come celebrate with Pastor Clara L Peters as she will be celebrating 6 years on Saturday, August 22, 2015. We will have a powerful Psalmist Lady Boldware and a mighty word by Pastor Sandra Deckard. God is going to do a mighty move, don’t miss it. Connect with Pastor Peters if you need to, her information is on the flyer as well. Clara Peters is a Pastor, mother of 3, grandmother of 5, radio talk show host, motivational speaker, mentor, certified life coach, certified peer recovery coach, author, and blogger. She is a woman of integrity. Founder of Divine Diva Book Club, if you would like to be a part of the book club send her a PM on FaceBook. Women of Divine Distinction Prayer Call each Monday, Wednesday, and Friday at 12 NOON CST, on Tuesday night at 7:00PM CST, Thursday, Saturday, and Sunday morning at 6:00 AM CST. The call in number is 605-562-3000 Access Code 290134#. You will be blessed, join the calls. For speaking engagement you can connect her via facebook, email address her at wodd.2011@yahoo.com or you can reach her at 832-490-9211. 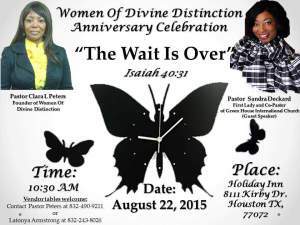 Women of Divine Distinction (W.O.D.D.) is about EMPOWERING and ENCOURAGING women to be all that they can be and let them know that they have a voice. Letting each woman know that failure is not an option, so go out and receive that purpose that GOD has just for you. To help redefine, renew, and restore what has been lost. Woman of God it is your time to spread your wings and soar…..use that voice and be the mighty woman that you were born to be. 2 Corinthians 3:12-18 Therefore, since we have such a hope, we are very bold. We are not like Moses, who would put a veil over his face to prevent the Israelites from seeing the end of what was passing away. But their minds were made dull, for to this day the same veil remains when the old covenant is read. It has not been removed, because only in Christ is it taken away. Even to this day when Moses is read, a veil covers their hearts. But whenever anyone turns to the Lord, the veil is taken away. Now the Lord is the Spirit, and where the Spirit of the Lord is, there is freedom. And we all, who with unveiled faces contemplate[a] the Lord’s glory, are being transformed into his image with ever-increasing glory, which comes from the Lord, who is the Spirit. Come out and celebrate with Pastor Clara L Peters, the Founder of Women of Divine Distinction Ministry on next Saturday. She thanks each of you in advance for sharing this day with her. We will have a bless time. For more information, see flyer. You can always connect with Pastor Clara L Peters as her number is also on the flyer.